Liz's Paper Loft: MCT Anything Goes ~ hello! MCT Anything Goes ~ hello! A BIG HELLO to you today! Over at My Creative Time it's Anything Goes. That's right no rules or guidelines! I wanted to share with you a card using something you may not think could be used all year long. I used Love is in the Air which most would think is only for Valentine's Day...but not me! First I stamped the balloon with VersaMark Ink on kraft cardstock. I die cut the "hello" three times and glued together. 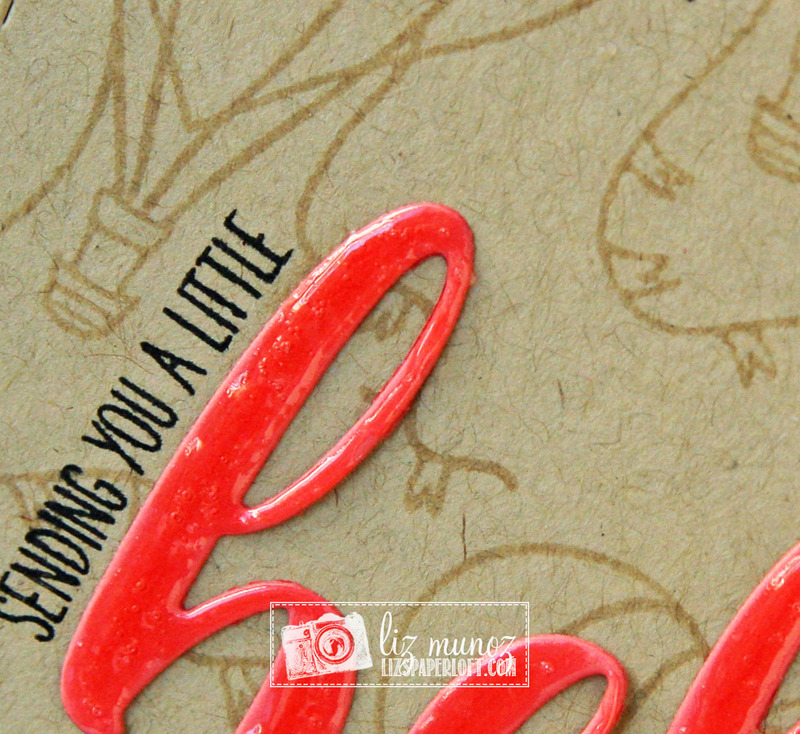 After attaching to the kraft cardstock, I stamped the sentiment, then added glossy accents to the "hello". Good Morning Miss Liz....OH My what a Gorgeous Card. Great job creating your own pattern paper...the look is Shabby/Chic Vintage Spectacular. Great idea cutting the hello 3 times to give it that dimension. Your card is Spectacular...definitely a Super Outstanding Creative job!! I so agree with you spread the love all year round. YOU SO ROCK!! Pretty card! Love the heart shaped hot air balloons!! 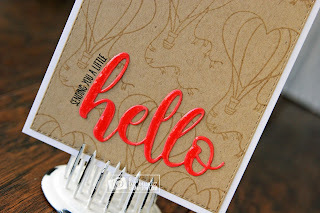 I love how stamping with Versa Mark makes a great tone on tone that looks great on any color card. 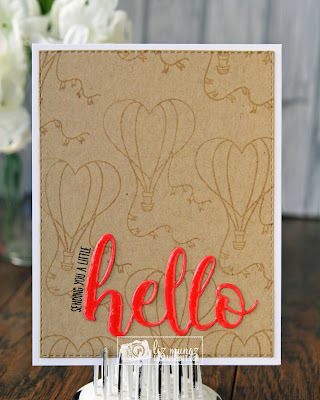 The balloon stamp makes a great all over background design! Beautiful card. Adorable card! 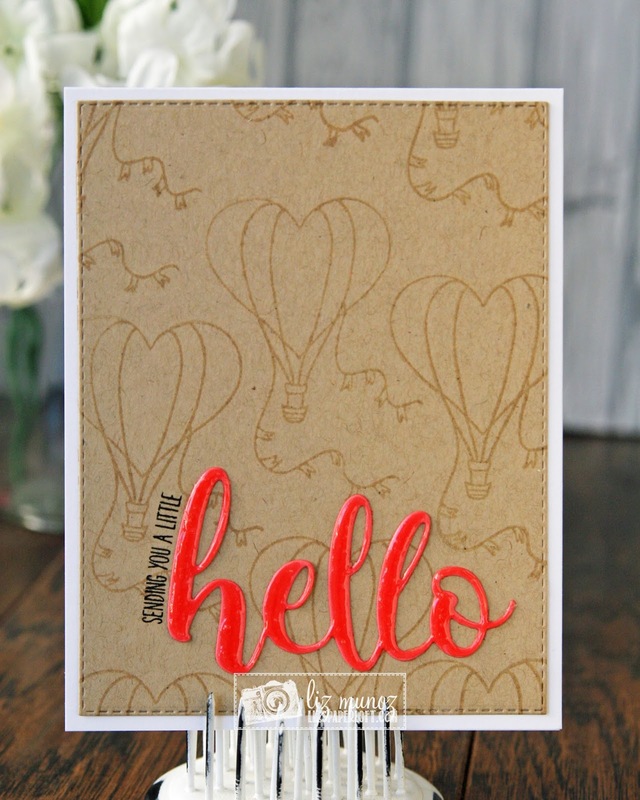 I love the stamped background, the heart balloon is so cute! Thanks for sharing and have a great weekend! So pretty, love the background!! MCT March Release Sneak Peek Day 3 ~ splash! MCT March Release Sneak Peek Day 2 ~ happiness! MCT March Release Sneak Peeks ~ beautiful day!